First I have to start with this. While sitting on the deck and enjoying the evening for a bit I turned my head and saw this shadow of my flowers being portrayed by the evening sun. I buzzed down there quickly. You have to react fast when your chasing a picture that the sun is involved with. It moves off so quickly. This was last may when I first planted these annuals. I used this metal topiary form to help the Salvia stay more upward and it has helped a lot. Initially I helped push the branches of the salvia back in place to help. I plant it mainly for the hummimgbirds and the bees love it too. This one is better formed. These are a very soft lemony colored petunia. Married with the blue salvia I think it's very pretty. I planted these Black Cherry Supertunias in these small pots. After a trip we made and a very hot weekend I had lost two plants in another set of planters so I transerred these over to those pots and they've been doing well. These pots were a more appropriate size anyway. This was potted with a petunia called Crazytunia Mandeville. Notice the pointy edges of the flower and their resemblence of the mandevilla flower. I also planted a yellow geranium and more Wojo's Jem vinca vine. The little statue sits on top of the planting medium on a tray. The yellow geraniums just hide among it all (disappointed with them). The petunias have grown well and so has the vinca vine. This is an up close picture of the yellow geraniums. I won't bother with them again. These are probably impressive in a mass bed planting. This Firecracker Fuschsia was dressed out with white alyssum around the border. The hummimgbird appreciates this fuchsia, and the white alyssum never disappoints! Last may when I first planted these white impatiens. Now they've filled in nicely! 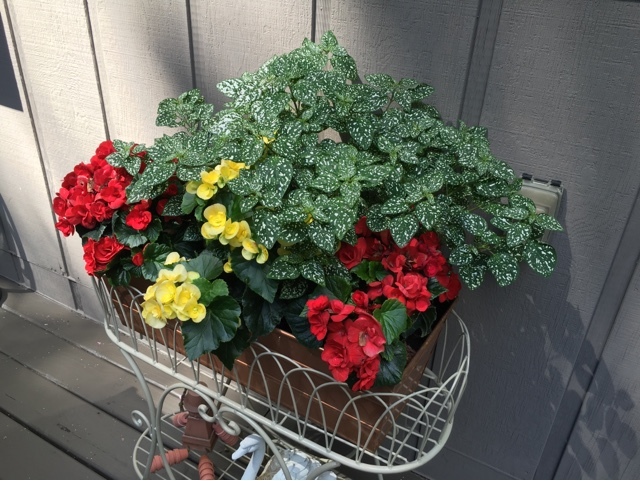 When I first planted this I visualized the polka dot plant would spread throughout and mingle in between the begonias. The spread out but went more upright than I expected but they didn't mingle in with the begonias like I had hoped. Overall I like the polka dotted green and white plant with the begonias. The vision here was for the morning glories to attached to the railings and spread out. Well they definitely attached themselves to the railing and spread out. I have to catch the vines daily and work them back in otherwise they'll take over all of the other plants. I'm real happy with how well this grew. In the past I tried it many years ago but I didn't put it in an area with enough sun. This is the most sunlight that occurs back here and it's only for a brief time in the morning. 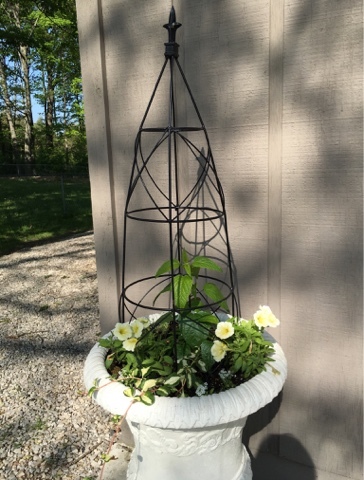 The hanging basket has a white New Guinea Impatiens in it but you'd never know. I think it's too shady for it. I planted a basic Vinca Vine that has done great in it. The two big cement planters out here didn't amount to much. 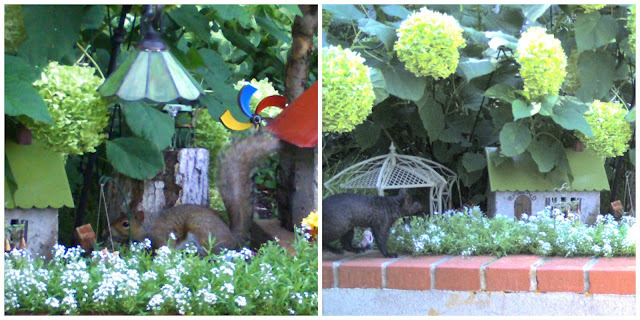 The trail camera was on and caught the bandits that have recently been digging and making a mess in my fairy garden! Oh well...living in harmony with nature isn't always easy is it! Your planters are gorgeous and I will be saving this post as a guide for next year. I think I water my planters too much, or perhaps too little. How often do you do it? I love all your groupings, especially the polka dot plant and begonias - very unusual! Your garden is looking wonderful. So pretty. Loving the colors and the pots you have used. Great garden. I always enjoying seeing how your garden is growing Liz and your containers are beautiful! I'll have to look for Crazytunia Mandeville next spring. I've given up on trying to grow geraniums and I have a love/hate relationship with squirrels. We have way too many with our trees and bird feeders. I had to give up on planting succulents because the squirrels were constantly digging them out of the pots, I guess for the water content. They chewed and scratched up my new indoor/outdoor rug by the front door of my shed I'm guessing looking for nesting material #@*%&!